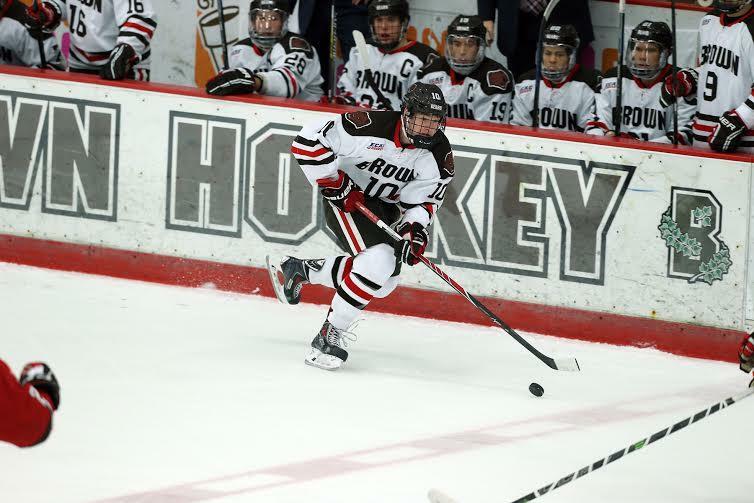 With the calendar turning to February and the ECAC regular season in its homestretch the No. 19 Quinnipiac Bobcats make the two hour trip up Route 95 to Providence, Rhode Island for a match up with the Brown Bears. Its the latest the Bobcats have met the Bears in the regular season since the 2012-2013 campaign that ended with a Quinnipiac run to the Frozen Four in Pittsburgh. The Bears have not beaten Quinnipiac since February of 2014 when they defeated the Bobcats 4-2 at Meehan Auditorium. Brendan Whittet's team this year is 4-16-1 but have been competitive in many of the games they have played this season. They are just very limited on talent and it has showed. Only one of their four wins this season is against a team over .500 and that was against Army. In Whittet's eight seasons with the Bears they have only one winning season and zero NCAA tournament berths. While that would get most coaches fired, Whittet is likely safe due to the fact that Brown doesn't put a huge emphais on their hockey program. The Bears have struggled on offense this season scoring 2.38 goals per game which is 47th in the country. 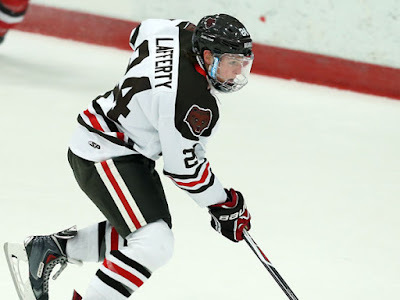 They have four solid juniors up front on offense led by Sam Lafferty (2014 NHL 4th, Pittsburgh) who has 27 points (8 goals and 19 assist) and is averaging 1.27 points per game. Charlie Corcoran, a Connecticut native is second on the team in points with 24 but leads in goals with 13. Four of his goals have come by way of the power play. Max Willman (2014 NHL 5th, Buffalo) has 19 points (9 goals and 10 assists) with four of his goal coming by way of the power play. Of the nine power play goals scored by the Bear, Corcoran and Willman have eight of them. Tyler Bird (2014 NHL 5th, Columbus) is another quality player for the Bears who has 9 points (4 goals and 5 assists). The rest of the forwards have some good size but are not the most talented of players. The power play is also pretty dismal scoring on 10.71% of their chances (9-of-84) which ranks them 57th in the country. Quinnipiac while not having a penalty kill like they did a season ago should still be able to handle the Bears depending on if players like Derek Smith and Kevin McKernan are available for this game. Brown on defense is the second worst team in the country at giving up goals at 4.19 per game. The one team behind them is Niagara at 4.36 goals per game. However, the Arizona State Sun Devils, who split with the Bobcats last weekend check in just ahead of the Bears at 4.13 goals per game. As the Sun Devils proved even having a team that gives up a lot of goals is still not a recipe to lose. Brown could follow this same formula against Quinnipiac and get hot goal-tending combined with decent defense and win. The Bears have played all eleven defenseman this season but eight of them have seen the most action. Five of the eight that see consistent minutes are underclassmen so there is some youth an inexperience back there. They bring some size on the blue line as nine of the eleven defenseman are 6'0 or bigger. Quinnipiac should have the ability to use their speed to create scoring opportunities and they need to play this game as the aggressor to dictate the game on their terms. The Bobcats should be able to take advantage of the Bears penalty kill which is the worst in the country at 70.1% (75-of-107). Even though the Bobcats power play is not as good as it was in years past its still should be good enough to score a goal or two against Brown. In goal the Bears start freshman Gavin Nieto a native of Yorba Linda, California. While he has a record of 3-13 with a 3.97 goals against average and a .875 save percentage in 18 games played a few of those games have really skewed the statistics. He has kept the Bears in some of these games for the most part this season especially after the turn of the calendar to the new year. Nieto won a NAHL championship last year with the Fairbanks Ice Dogs where he was dominant in the playoffs to the tune of a 1.37 goals against average and a .945 save percentage in 12 games played. He brings some future upside in net for Brown despite his tough rookie season. All time Quinnipiac holds a 17-7-6 advantage between the two teams. The Bobcats swept the Bears last season. This is really a game that Quinnipiac needs to win as they need to start putting together wins and confidence down the stretch as they look to position themselves for the ECAC tournament.